Seed infection by Fusarium pathogens possess a great risk for bread (Triticum aestivum L.) and durum (T. durum Desf.) wheat cultivation. Fusarium species are widespread pathogenic fungi, of which certain members can cause Fusarium Head Blight (FHB). FHB is one of the most widespread and damaging fungal disease affecting durum wheat and bread wheat production globally [1Parry DW, Jekinson P. MCleod L. Fusarium ear blight (scab) in small grain cereals-a review. Plant Pathol 1995; 44(2): 207-38. [http://dx.doi.org/10.1111/j.1365-3059.1995.tb02773.x] ]. FHB infect spikes at the stage of anthesis with inter and intra-cellular colonization of floral tissues and systemically spread within the spikelets, ultimately resulting in bleaching and premature death of spikes [2Dweba CC, Figlan S, Shimelis HA, et al. Fusarium head blight of wheat: Pathogenesis and control strategies. Crop Prot 2017; 91: 114-22. [http://dx.doi.org/10.1016/j.cropro.2016.10.002] ]. When favorable environmental conditions enable severe epidemics, it causes great reduction in grain yield (up to 50-70%) and quality by producing mycotoxins that make wheat unfit for food and feed [3McMullen M, Bergstrom G, De Wolf E, et al. A unified effort to fight an enemy of wheat and barley: Fusarium head blight. Plant Dis 2012; 96(12): 1712-28. [http://dx.doi.org/10.1094/PDIS-03-12-0291-FE] [PMID: 30727259] ]. A complex of seventeen Fusarium species has been isolated from wheat heads with FHB symptoms. Globally, F. graminearum and F. culmorum are found to be the main disease causal agent. In addition, other causal agents are less frequently encountered species such as F. equiseti, F. cerealis and F. poae and, to a lesser extent, F. oxysporum, F. solani, and F. verticillioides [4Bottalico A, Perrone G. Toxigenic Fusarium species and mycotoxins associated with head blight in small-grain cereals in Europe. Eur J Plant Pathol 2002; 108(7): 611-24. [http://dx.doi.org/10.1023/A:1020635214971] , 5Xu X, Nicholson P. Community ecology of fungal pathogens causing wheat head blight. Annu Rev Phytopathol 2009; 47: 83-103. [http://dx.doi.org/10.1146/annurev-phyto-080508-081737] [PMID: 19385728] ]. Practices to manage FHB include the breeding of resistant varieties to the fungus, disease forecasting, direct chemical fungicide treatment, bacterial antagonists as biocontrol agents and crop rotation [2Dweba CC, Figlan S, Shimelis HA, et al. Fusarium head blight of wheat: Pathogenesis and control strategies. Crop Prot 2017; 91: 114-22. [http://dx.doi.org/10.1016/j.cropro.2016.10.002] , 6Shi C, Yan P, Li J, Wu H, Li Q, Guan S. Biocontrol of Fusarium graminearum growth and deoxynivalenol production in wheat kernels with bacterial antagonists. Int J Environ Res Public Health 2014; 11(1): 1094-105. [http://dx.doi.org/10.3390/ijerph110101094] [PMID: 24441510] ]. To date, the development of tolerant or resistant cultivars is the most practical, cost-effective and environmentally friendly disease management approach [7Steiner B, Buerstmayr M, Michel S, Schweiger W, Lemmens M, Buerstmayr H. Breeding strategies and advances in line selection for Fusarium head blight resistance in wheat. Trop Plant Pathol 2017; 42(3): 165-74. [http://dx.doi.org/10.1007/s40858-017-0127-7] , 8Kosova K, Chrpova J, Sip V. Cereal resistance to fusarium head blight and possibilities of its improvement through breeding. Czech J Genet Plant Breed 2009; 45(3): 87-105. [http://dx.doi.org/10.17221/63/2009-CJGPB] ]. Wheat exhibits two primary kinds of quantitative resistance to FHB which are termed type I (resistance to initial infection after spray inoculation) and type II (resistance to fungal spread within the head after point inoculation) resistance [9Mesterhazy A. Types and components of resistance to Fusarium head blight of wheat. Plant Breed 1995; 114(5): 377-86. [http://dx.doi.org/10.1111/j.1439-0523.1995.tb00816.x] ]. Resistance to FHB is a quantitative trait showing polygenic inheritance, and is modulated by significant cultivar-environment interactions. Compared to bread wheat, little information is available about Quantitative Trait Loci (QTLs) involved in FHB durum resistance, with most current durum wheat cultivars highly susceptible to FHB infection [10Buerstmayr H, Ban T, Anderson JA. QTL mapping and marker-assisted selection for Fusarium head blight resistance in wheat: A review. Plant Breed 2009; 128(1): 1-26. [http://dx.doi.org/10.1111/j.1439-0523.2008.01550.x] ]. Wheat is one of the main crops in Mediterranean countries. Its domestication has occurred between 12000 and 10000 years BP in Syria. Wheat (durum and bread) is one of the most important crops occupying up to 24% of the cultivated area, with an annual production of 3.9 million tons in 2011 [11FAO/WFP [homepage on the Internet]. Crop and food security assessment mission to the Syrian Arab Republic 2015 [updated 2015 July 23] Available from http://www.wfp.org/foodsecurity/reports /CFSAM]. There are five distinct agro-climatic zones based on rainfall [12FWD [homepage on the Internet]. Field Wheat Directory. [updated 2007] Available http://gcsar.gov.sy/ar/wp-content/uploads/weatguide .pdf]. Bread wheat is cultivated mainly in irrigated areas (zones 1 and 2), and durum wheat in rainfed areas (zones 3, 4 and 5), i.e., Cham1 (durum) is planted in rainfed and irrigated areas (zone 1) and Cham6 (bread) is adapted for rainfed agriculture and planted in both zones (1 and 2) [12FWD [homepage on the Internet]. Field Wheat Directory. [updated 2007] Available http://gcsar.gov.sy/ar/wp-content/uploads/weatguide .pdf]. Namely FHB species: culmorum was the most frequent (43.8%), followed by F. equiseti (23.3%), F. moniliforme (14.6%), F. proliferatum (7.1%), F. sambucinum (2.9%), F. compactum (2.1%), F. solani (1.7%), F. crookwellense (0.8%), F. avenaceum (0.8%), and F. semitectum (0.4%) were recovered during spring of three seasons (2008-2010) from wheat seeds showing FHB across 20 locations/fields of Ghab Plain (zone 1), one of the principal Syrian wheat production areas [13Al-Chaabi S, Al-Masri S, Nehlawi A, Al-Matroud L, Abu-Fadel T. Monitoring of Fusarium wheat head blight distribution, its causal agents, and pathogenicity variation in Al-Ghab plain, Syria. Arab J Plant Prot 2018; 36(2): 98-113. [http://dx.doi.org/10.22268/AJPP-036.2.098113] ]. Most frequent FHB species were F. tricinctum (30% of all Fusarium isolates), F. culmorum (18%), F. equiseti (14%) and F. graminearum (13%) from wheat spikes with FHB symptoms across five different Syrian provinces (zones 1, 2 and 3), except for Ghab Plain [14Alkadri D, Nipoti P, Döll K, Karlovsky P, Prodi A, Pisi A. Study of fungal colonization of wheat kernels in syria with a focus on Fusarium species. Int J Mol Sci 2013; 14(3): 5938-51. [http://dx.doi.org/10.3390/ijms14035938] [PMID: 23493058] ]. Earlier studies have reported the evaluation of type I and Type II resistance in the field, growth chamber and in vitro assays of Syrian wheat cultivars to FHB pathogens and differential reactions on cultivars were detected [15Alazem M. Evaluating genetic variation of Fusarium head blight by molecular markers. Damascus (Syria): University of Damascus 2007; 72.-17Alkadri D, Tonti S, Amato B, Nipoti P, Pisi A, Prodi A. Assessment of different resistance types of Syrian durum wheat cultivars towards FHB agent. Plant Pathol J 2015; 14(2): 86-91. [http://dx.doi.org/10.3923/ppj.2015.86.91] ], i.e., Cham6 showed lower levels of spikelet (type II) damage than did Cham1 [15Alazem M. Evaluating genetic variation of Fusarium head blight by molecular markers. Damascus (Syria): University of Damascus 2007; 72., 17Alkadri D, Tonti S, Amato B, Nipoti P, Pisi A, Prodi A. Assessment of different resistance types of Syrian durum wheat cultivars towards FHB agent. Plant Pathol J 2015; 14(2): 86-91. [http://dx.doi.org/10.3923/ppj.2015.86.91] ]. Under controlled and field conditions, evaluation of FHB resistance of wheat at the adult plant stage is determined by evaluating disease symptoms in planta. However, it is laborious, time consuming, requires a large space and appropriate equipment over several months and depends whether the environmental conditions are favorable for disease development [2Dweba CC, Figlan S, Shimelis HA, et al. Fusarium head blight of wheat: Pathogenesis and control strategies. Crop Prot 2017; 91: 114-22. [http://dx.doi.org/10.1016/j.cropro.2016.10.002] , 5Xu X, Nicholson P. Community ecology of fungal pathogens causing wheat head blight. Annu Rev Phytopathol 2009; 47: 83-103. [http://dx.doi.org/10.1146/annurev-phyto-080508-081737] [PMID: 19385728] , 7Steiner B, Buerstmayr M, Michel S, Schweiger W, Lemmens M, Buerstmayr H. Breeding strategies and advances in line selection for Fusarium head blight resistance in wheat. Trop Plant Pathol 2017; 42(3): 165-74. [http://dx.doi.org/10.1007/s40858-017-0127-7] , 8Kosova K, Chrpova J, Sip V. Cereal resistance to fusarium head blight and possibilities of its improvement through breeding. Czech J Genet Plant Breed 2009; 45(3): 87-105. [http://dx.doi.org/10.17221/63/2009-CJGPB] ]. Therefore, there has been an interest in developing in vitro assays to provide methods for prescreening FHB resistance. In vitro methodologies predicting resistance at early plant stage have been evaluated, even though results are varied [18Browne RA. Components of resistance to fusarium head blight (FHB) in wheat detected in a seed-germination assay with Microdochium majus and the relationship to FHB disease development and mycotoxin accumulation from Fusarium graminearum infection. Plant Pathol 2007; 56(1): 65-72. [http://dx.doi.org/10.1111/j.1365-3059.2006.01509.x] -24Soresi D, Zappacosta D, Garayalde A, Miranda R, Carrera A. An in vitro assay for pre-screening resistance to Fusarium head blight in durum wheat. Phytopathol Mediterr 2015; 54(2): 253-64. [http://dx.doi.org/10.14601/Phytopathol_Mediterr-14986] ]. Recently, Sakr [25Sakr N. Components of quantitative resistance in barley plants to Fusarium head blight infection determined using three in vitro assays. J Plant Prot Res 2018; 58(2): 176-83. [http://dx.doi.org/10.24425/122933] ] quantified FHB resistance in barley plants using nine components involved in three in vitro assays (detached leaf, modified Petri-dish and seedling tests) widely used in FHB-wheat studies [19Browne RA, Cooke BM. Development and evaluation of an in vitro detached leaf assay for pre-screening resistance to Fusarium head blight in wheat. Eur J Plant Pathol 2004; 110(1): 91-102. [http://dx.doi.org/10.1023/B:EJPP.0000010143.20226.21] -23Shin S, Kim KH, Kang CS, et al. Simple method for the assessment of Fusarium head blight resistance in Korean wheat seedlings inoculated with Fusarium graminearum. Plant Pathol J 2014; 30(1): 25-32. [http://dx.doi.org/10.5423/PPJ.OA.06.2013.0059] [PMID: 25288982] , 26Purahong W, Alkadri D, Nipoti P, Pisi A, Lemmens M, Prodi A. Validation of a modified Petri-dish test to quantify aggressiveness of Fusarium graminearum in durum wheat. Eur J Plant Pathol 2012; 132(3): 381-91. [http://dx.doi.org/10.1007/s10658-011-9883-2] ]. The quantitative components were: Incubation period, latent period and lesion length of detached leaf assay; germination rate reduction, area under disease progress curve and coleoptile length reduction of modified Petri-dish assay; and percentage of infected seedlings of foliar-spraying and pin-point inoculations and lesion length of clip-dipping inoculation of seedling assay. Two Syrian widely grown wheat cultivars: Cham1 (durum, released in 1983) and Cham6 (bread, released in 1991) with highest agronomic characteristics and resistance to biotic and abiotic stresses [12FWD [homepage on the Internet]. Field Wheat Directory. [updated 2007] Available http://gcsar.gov.sy/ar/wp-content/uploads/weatguide .pdf] were used to set up experimental trials for in planta and in vitro assays. Sixteen Fusarium isolates comprising four species were obtained during the 2015 growing season on wheat spikes with FHB symptoms across nine villages in Ghab Plain. These 16 isolates consisted of F. culmorum (isolates F1, F2, F3, F28 and F30), F. verticillioides (isolates F15, F16, F21 and F27), F. solani (isolates F7, F20, F26, F29, F31 and F35), and F. equiseti (isolate F43), which were used for artificial inoculation. Although F. graminearum is considered the major causative of FHB complex worldwide [4Bottalico A, Perrone G. Toxigenic Fusarium species and mycotoxins associated with head blight in small-grain cereals in Europe. Eur J Plant Pathol 2002; 108(7): 611-24. [http://dx.doi.org/10.1023/A:1020635214971] , 5Xu X, Nicholson P. Community ecology of fungal pathogens causing wheat head blight. Annu Rev Phytopathol 2009; 47: 83-103. [http://dx.doi.org/10.1146/annurev-phyto-080508-081737] [PMID: 19385728] ], this species was not found in the surveyed region as observed in other studies investigating the composition of FHB complex species in Ghab Plain [13Al-Chaabi S, Al-Masri S, Nehlawi A, Al-Matroud L, Abu-Fadel T. Monitoring of Fusarium wheat head blight distribution, its causal agents, and pathogenicity variation in Al-Ghab plain, Syria. Arab J Plant Prot 2018; 36(2): 98-113. [http://dx.doi.org/10.22268/AJPP-036.2.098113] , 15Alazem M. Evaluating genetic variation of Fusarium head blight by molecular markers. Damascus (Syria): University of Damascus 2007; 72.]. 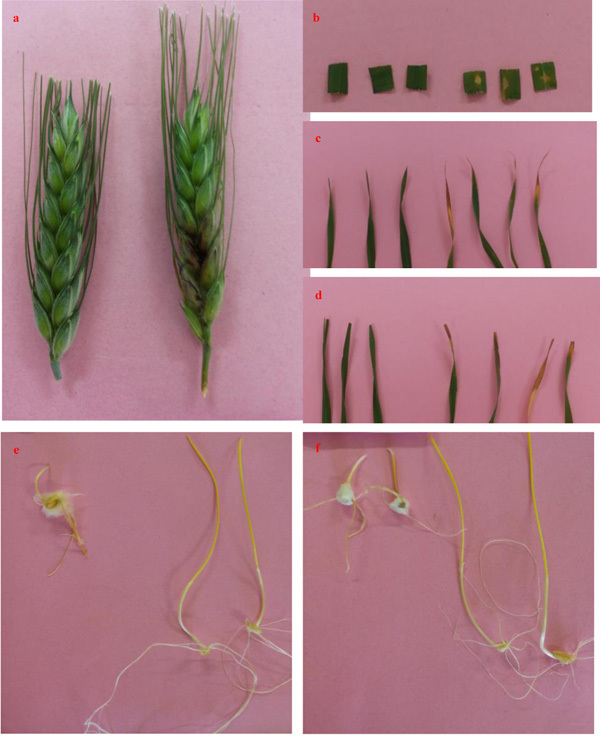 To ensure adequate pathogenicity on the two wheat cultivars, the pathogenicity of the 16 FHB isolates was pre-screened for in planta and in vitro disease reactions [27Sakr N. Aggressiveness of four Fusarium head blight species on wheat cultivars. Adv Hortic Sci 2017; 31(3): 199-203. [http://dx.doi.org/10.13128/ahs-20585] -31Sakr N. Intra- and inter-species variability of the aggressiveness in four Fusarium head blight species on durum wheat plants detected in an in vitro Petri-dish assay. Arch Phytopathol Pflanzenschutz 2019. [http://dx.doi.org/10.1080/03235408.2018.1495390] ]. Isolates were identified morphologically according to Nelson et al. [32Nelson PE, Toussoun TA, Marasas WFO. Fusarium Species: An Illustrated Manual for Identification. 1rst ed Pennsylvania, PA: The Pennsylvania State Univ Press 1983; p. 193.]. For long term preservation, fungal cultures were maintained in sterile distilled water at 4°C and freezing at -16°C [33Sakr N. Evaluation of two storage methods for fungal isolates of Fusarium sp. and Cochliobolus sativus. Acta Phytopathol Entomol Hung 2018; 53(1): 11-8. [http://dx.doi.org/10.1556/038.53.2018.003] ]. The detached-leaf resistance assay was assessed using the methodology described by Browne and Cooke [19Browne RA, Cooke BM. Development and evaluation of an in vitro detached leaf assay for pre-screening resistance to Fusarium head blight in wheat. Eur J Plant Pathol 2004; 110(1): 91-102. [http://dx.doi.org/10.1023/B:EJPP.0000010143.20226.21] , 20Browne RA, Cooke BM. A comparative assessment of potential components of partial disease resistance to Fusarium head blight using a detached leaf assay of wheat, barley and oats. Eur J Plant Pathol 2005; 112(3): 247-58. [http://dx.doi.org/10.1007/s10658-005-2077-z] ], Browne et al. [21Browne RA, Murphy JP, Cooke BM, et al. Evaluation of components of Fusarium head blight resistance in soft red winter wheat germ plasm using a detached leaf assay. Plant Dis 2005; 89(4): 404-11. [http://dx.doi.org/10.1094/PD-89-0404] [PMID: 30795457] ] and Browne [22Browne RA. Investigation into components of partial disease resistance, determined in vitro, and the concept of types of resistance to Fusarium head blight (FHB) in wheat. Eur J Plant Pathol 2009; 123(2): 229-34. [http://dx.doi.org/10.1007/s10658-008-9353-7] ], the modified Petri-dish resistance assay was performed using the methodology of Purahong et al. [26Purahong W, Alkadri D, Nipoti P, Pisi A, Lemmens M, Prodi A. Validation of a modified Petri-dish test to quantify aggressiveness of Fusarium graminearum in durum wheat. Eur J Plant Pathol 2012; 132(3): 381-91. [http://dx.doi.org/10.1007/s10658-011-9883-2] ], and the seedling resistance assay was done using the methodology of Shin et al. [23Shin S, Kim KH, Kang CS, et al. Simple method for the assessment of Fusarium head blight resistance in Korean wheat seedlings inoculated with Fusarium graminearum. Plant Pathol J 2014; 30(1): 25-32. [http://dx.doi.org/10.5423/PPJ.OA.06.2013.0059] [PMID: 25288982] ]. All methods are presented in detail by Sakr [24Soresi D, Zappacosta D, Garayalde A, Miranda R, Carrera A. An in vitro assay for pre-screening resistance to Fusarium head blight in durum wheat. Phytopathol Mediterr 2015; 54(2): 253-64. [http://dx.doi.org/10.14601/Phytopathol_Mediterr-14986] ] on barley plants. In the detached-leaf resistance assay [19Browne RA, Cooke BM. Development and evaluation of an in vitro detached leaf assay for pre-screening resistance to Fusarium head blight in wheat. Eur J Plant Pathol 2004; 110(1): 91-102. [http://dx.doi.org/10.1023/B:EJPP.0000010143.20226.21] -22Browne RA. Investigation into components of partial disease resistance, determined in vitro, and the concept of types of resistance to Fusarium head blight (FHB) in wheat. Eur J Plant Pathol 2009; 123(2): 229-34. [http://dx.doi.org/10.1007/s10658-008-9353-7] ], the components measured were: incubation period (period in days from inoculation to first appearance on the leaf surface, a dull gray-green water-soaked lesion), latent period (period in days from inoculation to sporulation), and lesion length (measured after 7 DAI as a visible necrotic area). In the modified Petri-dish resistance assay [26Purahong W, Alkadri D, Nipoti P, Pisi A, Lemmens M, Prodi A. Validation of a modified Petri-dish test to quantify aggressiveness of Fusarium graminearum in durum wheat. Eur J Plant Pathol 2012; 132(3): 381-91. [http://dx.doi.org/10.1007/s10658-011-9883-2] ], the components measured were: germination rate reduction and coleoptile length reduction determined by comparison with the water control treatment 6 DAI and standard area under disease progress curve ranged from 0 (very resistant) to 1 (not resistant) and calculated from the percentage of healthy coleoptiles as a function of time (from 2 to 6 DAI). In the seedling assay [23Shin S, Kim KH, Kang CS, et al. Simple method for the assessment of Fusarium head blight resistance in Korean wheat seedlings inoculated with Fusarium graminearum. Plant Pathol J 2014; 30(1): 25-32. [http://dx.doi.org/10.5423/PPJ.OA.06.2013.0059] [PMID: 25288982] ], the components tested were: the percentage of infected seedlings with visible necrotic lesion and/or sporulation of fungal disease symptoms measured 7 DAI and assessed using pin-point and foliar-spraying tests and lesion length with a water-soaked necrotic and/or cholortic area assessed using clip-dipping inocualtion. Each treatment was arranged in a complete randomized design with three replicates, and the experiment was repeated. Results were similar between the experiments and the data from the second experiment are presented. The in planta and in vitro data were performed using StatView, 4.57® Abacus Concepts, Berkley, Canada. Prior to analysis, the percentage of disease severity, germination rate reduction, coleoptile length reduction and infected seedlings were transformed using the angular transformation to stabilize variances. ANOVA incorporating the Fisher’s LSD test at the 5% level of significance was used to evaluate differences in the two tested wheat cultivars [34Gomez KA, Gomez AA. Statistical Procedures for Agricultural Research 2nd ed. 2nd ed.1984; 680.]. The significant wheat cultivar x FHB isolate interactions were assessed for all measured quantitative resistance criteria. The sample correlation coefficients (Pearson r) were calculated among data of FHB resistance (Type II) and in vitro assays at a significant level of 5%. Results showed that neither of the two tested wheat cultivars: Cham1 (durum) and Cham6 (bread) escaped from head blight disease (Table 1). Typical FHB symptoms induced by the 16 fungal isolates were clear and easy to score in the inoculated spikelets, while no symptoms were present in the control plants (Fig. 1 ). The symptoms showed after 7 DAI, and disease resistance was scored 21 DAI. Point inoculation of central spikelets conducted to asses FHB resistance revealed statistically significant differences (Probability, p=0.0261) in the resistance of Cham1 and Cham6, calculated as the average percentage of affected spikelets per ear at 21 DAI. The fraction of plants showing disease symptoms ranged from 32 to 49% on Cham6 and from 30 to 55% on Cham1. The fungus/host interaction for FHB severity was significant (p=0.0102). The statistical analysis shows that there is no significant difference between the two tested cultivars, except for F1 and F28 (F. culmorum). Overall, exposure of treatments for the nine quantitative resistance components on two tested wheat cultivars to 16 FHB isolates reduced mean values relative to the water controls, suggesting a strong effect of different Fusarium isolates on the growth of these cultivars (Tables 2-4). Seedlings of two wheat cultivars growing in the presence of 16 FHB isolates showed typical in vitro FHB symptoms according to three tested assays, whereas the control plants did not show any disease symptoms (Fig. 1 ). Fusarium head blight severity (% symptomatic spikelets/spike) for in planta Type II resistance under controlled conditions in two Syrian wheat cultivars (Cahm1, durum and Cham6, bread) inoculated with 16 fungal isolates of four Fusarium head blight species. in planta and in vitro inoculations techniques used to assess Fusarium head blight resistance on plant materials of Syrian durum wheat cultivar Cham1 infected with F1 (F. culmorum), (a) point inoculation assay, (b) detached-leaf assay, (c) foliar-spraying assay, (d) clip-dipping assay, (e) pin-point assay and (f) modified Petri-dish assay. Disease responses of in vitro detached leaf assay in two Syrian wheat cultivars (Cahm1, durum and Cham6, bread) inoculated with 16 fungal isolates of four Fusarium head blight species. Disease reactions of in vitro Petri-dish assay in two Syrian wheat cultivars (Cahm1, durum and Cham6, bread) inoculated with 16 fungal isolates of four Fusarium head blight species. Disease reactions of in vitro seedling assay in two Syrian wheat cultivars (Cahm1, durum and Cham6, bread) inoculated with 16 fungal isolates of four Fusarium head blight species. Knowledge of Fusarium Head Blight (FHB) resistance in wheat gene pool could be pivotal in forecasting schemes for disease control and reducing damage inflicted by FHB [2Dweba CC, Figlan S, Shimelis HA, et al. Fusarium head blight of wheat: Pathogenesis and control strategies. Crop Prot 2017; 91: 114-22. [http://dx.doi.org/10.1016/j.cropro.2016.10.002] , 7Steiner B, Buerstmayr M, Michel S, Schweiger W, Lemmens M, Buerstmayr H. Breeding strategies and advances in line selection for Fusarium head blight resistance in wheat. Trop Plant Pathol 2017; 42(3): 165-74. [http://dx.doi.org/10.1007/s40858-017-0127-7] , 8Kosova K, Chrpova J, Sip V. Cereal resistance to fusarium head blight and possibilities of its improvement through breeding. Czech J Genet Plant Breed 2009; 45(3): 87-105. [http://dx.doi.org/10.17221/63/2009-CJGPB] ]. Type I and Type II resistance detected using in planta spray and point inoculations (visual scoring of diseased head and spikelet symptoms) is critical for the selection of resistant or tolerant wheat cultivars. However, the head and floret inoculation techniques are costly, time consuming, laborious and can be greatly influenced by growth stage and environmental factors [2Dweba CC, Figlan S, Shimelis HA, et al. Fusarium head blight of wheat: Pathogenesis and control strategies. Crop Prot 2017; 91: 114-22. [http://dx.doi.org/10.1016/j.cropro.2016.10.002] , 5Xu X, Nicholson P. Community ecology of fungal pathogens causing wheat head blight. Annu Rev Phytopathol 2009; 47: 83-103. [http://dx.doi.org/10.1146/annurev-phyto-080508-081737] [PMID: 19385728] , 7Steiner B, Buerstmayr M, Michel S, Schweiger W, Lemmens M, Buerstmayr H. Breeding strategies and advances in line selection for Fusarium head blight resistance in wheat. Trop Plant Pathol 2017; 42(3): 165-74. [http://dx.doi.org/10.1007/s40858-017-0127-7] , 8Kosova K, Chrpova J, Sip V. Cereal resistance to fusarium head blight and possibilities of its improvement through breeding. Czech J Genet Plant Breed 2009; 45(3): 87-105. [http://dx.doi.org/10.17221/63/2009-CJGPB] ]. More rapid and accurate methods to identify resistance to FHB infection are need for cereal breeding. Syrian wheat cultivars may constitute a valuable genetic resource, possessing various desirable agronomic traits, including acceptable-level resistance to FHB [15Alazem M. Evaluating genetic variation of Fusarium head blight by molecular markers. Damascus (Syria): University of Damascus 2007; 72.-17Alkadri D, Tonti S, Amato B, Nipoti P, Pisi A, Prodi A. Assessment of different resistance types of Syrian durum wheat cultivars towards FHB agent. Plant Pathol J 2015; 14(2): 86-91. [http://dx.doi.org/10.3923/ppj.2015.86.91] ]. To update our knowledge, we analyzed the relationship between in vitro resistance assays and in planta adult resistance in two widely grown Syrian durum and bread wheat cultivars. Durum wheat is more susceptible to FHB infection than bread wheat [5Xu X, Nicholson P. Community ecology of fungal pathogens causing wheat head blight. Annu Rev Phytopathol 2009; 47: 83-103. [http://dx.doi.org/10.1146/annurev-phyto-080508-081737] [PMID: 19385728] ]. The data show that the two cultivars differed in their FHB resistance and susceptibility behaviour, in which the spread of the pathogen within the head (type II resistance) was related to cultivar resistance [35Wisniewska H, Perkowski J, Kaczmarek Z. Scab response and deoxynivalenol accumulation in spring wheat kernels of different geographical origins following inoculation with Fusarium culmorum. J Phytopathol 2004; 152(11-12): 613-21. [http://dx.doi.org/10.1111/j.1439-0434.2004.00904.x] ]. In planta testing provides evidence that significant differences were detected between Cham6 (bread) and Cham1 (durum). Cham1 seems to exhibit more FHB disease severity than Cham6. Thus, Cham6 appears to be more resistant than Cham1. Our results are in accordance with those found by Alazem [15Alazem M. Evaluating genetic variation of Fusarium head blight by molecular markers. Damascus (Syria): University of Damascus 2007; 72. ], in which the mean disease score for Type II resistance measured under controlled conditions of 32 fungal isolates of nine FHB species was 13.40% on Cham6 and it was considered as resistant. Moreover, Alkadri et al. [17Alkadri D, Tonti S, Amato B, Nipoti P, Pisi A, Prodi A. 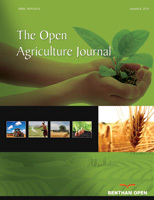 Assessment of different resistance types of Syrian durum wheat cultivars towards FHB agent. Plant Pathol J 2015; 14(2): 86-91. [http://dx.doi.org/10.3923/ppj.2015.86.91] ] observed that Cham1 was susceptible after inoculation with Syrian and Italian F. culmorum strains in the growth chamber and in the field and the mean disease development score for Type II resistance was recorded 25.7%. Indeed, four durum Syrian wheat landraces had a low mean FHB rating (19–25%) compared to German durum varieties (56–60%) under German field conditions [16Talas F, Longin F, Miedaner T. Sources of resistance to Fusarium head blight within Syrian durum wheat landraces. Plant Breed 2011; 130(3): 398-400. [http://dx.doi.org/10.1111/j.1439-0523.2011.01867.x] ]. Since Alazem [15Alazem M. Evaluating genetic variation of Fusarium head blight by molecular markers. Damascus (Syria): University of Damascus 2007; 72.] and Alkadri et al. [17Alkadri D, Tonti S, Amato B, Nipoti P, Pisi A, Prodi A. Assessment of different resistance types of Syrian durum wheat cultivars towards FHB agent. Plant Pathol J 2015; 14(2): 86-91. [http://dx.doi.org/10.3923/ppj.2015.86.91] ] conducted their studies under similar conditions that our study, the differences in the values of disease severity rating for the two wheat cultivars (from 32 to 49% on Cham6 and 30 to 55% on Cham1) are comparable with the previous data [15Alazem M. Evaluating genetic variation of Fusarium head blight by molecular markers. Damascus (Syria): University of Damascus 2007; 72., 17Alkadri D, Tonti S, Amato B, Nipoti P, Pisi A, Prodi A. Assessment of different resistance types of Syrian durum wheat cultivars towards FHB agent. Plant Pathol J 2015; 14(2): 86-91. [http://dx.doi.org/10.3923/ppj.2015.86.91] ]. One possibility could be that the isolates used are more aggressive, however, further investigation is required in order to draw any final conclusions. It appears possible that wide usage of wheat cultivars showing high levels of quantitative resistance could lead to increases in aggressiveness in FHB as observed for the pathosystem Mycosphaerella graminicola ⁄ T. aestivum [36Cowger C, Mundt CC. Aggressiveness of Mycosphaerella graminicola isolates from susceptible and partially resistant wheat cultivars. Phytopathology 2002; 92(6): 624-30. [http://dx.doi.org/10.1094/PHYTO.2002.92.6.624] [PMID: 18944259] ]. Despite these differences in disease severity scores, the standard Area Under Disease Progress Curve (AUDPCstandard) did indicate that Cham6 was more resistant than Cham1. Detached leaf, modified Petri-dish and seedling assays were selected on the basis of their similarity to adult plant spikelet inoculation using point inoculation assay [19Browne RA, Cooke BM. Development and evaluation of an in vitro detached leaf assay for pre-screening resistance to Fusarium head blight in wheat. Eur J Plant Pathol 2004; 110(1): 91-102. [http://dx.doi.org/10.1023/B:EJPP.0000010143.20226.21] , 21Browne RA, Murphy JP, Cooke BM, et al. Evaluation of components of Fusarium head blight resistance in soft red winter wheat germ plasm using a detached leaf assay. Plant Dis 2005; 89(4): 404-11. [http://dx.doi.org/10.1094/PD-89-0404] [PMID: 30795457] -23Shin S, Kim KH, Kang CS, et al. Simple method for the assessment of Fusarium head blight resistance in Korean wheat seedlings inoculated with Fusarium graminearum. Plant Pathol J 2014; 30(1): 25-32. [http://dx.doi.org/10.5423/PPJ.OA.06.2013.0059] [PMID: 25288982] , 26Purahong W, Alkadri D, Nipoti P, Pisi A, Lemmens M, Prodi A. Validation of a modified Petri-dish test to quantify aggressiveness of Fusarium graminearum in durum wheat. Eur J Plant Pathol 2012; 132(3): 381-91. [http://dx.doi.org/10.1007/s10658-011-9883-2] ]. These assays provide different experimental conditions by simulating the interaction between wheat tissues and fungi. FHB inocula were put directly on the wheat seeds, leaves and seedlings (without glumes) and they could directly penetrate and infect germinating seeds as well as leaves and seedlings. Thus, disease development is manifested through appearance of symptoms such as brown spots on the coleoptiles and/or by mycelium completely covering the seeds, discoloured, malformed, necrotic or chlorotic areas on the infected plant part [19Browne RA, Cooke BM. Development and evaluation of an in vitro detached leaf assay for pre-screening resistance to Fusarium head blight in wheat. Eur J Plant Pathol 2004; 110(1): 91-102. [http://dx.doi.org/10.1023/B:EJPP.0000010143.20226.21] , 21Browne RA, Murphy JP, Cooke BM, et al. Evaluation of components of Fusarium head blight resistance in soft red winter wheat germ plasm using a detached leaf assay. Plant Dis 2005; 89(4): 404-11. [http://dx.doi.org/10.1094/PD-89-0404] [PMID: 30795457] -23Shin S, Kim KH, Kang CS, et al. Simple method for the assessment of Fusarium head blight resistance in Korean wheat seedlings inoculated with Fusarium graminearum. Plant Pathol J 2014; 30(1): 25-32. [http://dx.doi.org/10.5423/PPJ.OA.06.2013.0059] [PMID: 25288982] , 26Purahong W, Alkadri D, Nipoti P, Pisi A, Lemmens M, Prodi A. Validation of a modified Petri-dish test to quantify aggressiveness of Fusarium graminearum in durum wheat. Eur J Plant Pathol 2012; 132(3): 381-91. [http://dx.doi.org/10.1007/s10658-011-9883-2] ]. Although the detached leaf and modified Petri-dish assays predicted initial infection after spray inoculation [19Browne RA, Cooke BM. Development and evaluation of an in vitro detached leaf assay for pre-screening resistance to Fusarium head blight in wheat. Eur J Plant Pathol 2004; 110(1): 91-102. [http://dx.doi.org/10.1023/B:EJPP.0000010143.20226.21] , 21Browne RA, Murphy JP, Cooke BM, et al. Evaluation of components of Fusarium head blight resistance in soft red winter wheat germ plasm using a detached leaf assay. Plant Dis 2005; 89(4): 404-11. [http://dx.doi.org/10.1094/PD-89-0404] [PMID: 30795457] , 22Browne RA. Investigation into components of partial disease resistance, determined in vitro, and the concept of types of resistance to Fusarium head blight (FHB) in wheat. Eur J Plant Pathol 2009; 123(2): 229-34. [http://dx.doi.org/10.1007/s10658-008-9353-7] , 26Purahong W, Alkadri D, Nipoti P, Pisi A, Lemmens M, Prodi A. Validation of a modified Petri-dish test to quantify aggressiveness of Fusarium graminearum in durum wheat. Eur J Plant Pathol 2012; 132(3): 381-91. [http://dx.doi.org/10.1007/s10658-011-9883-2] ], however, FHB resistance determined by seedling assay did not correlate with type I resistance in adult plants [23Shin S, Kim KH, Kang CS, et al. Simple method for the assessment of Fusarium head blight resistance in Korean wheat seedlings inoculated with Fusarium graminearum. Plant Pathol J 2014; 30(1): 25-32. [http://dx.doi.org/10.5423/PPJ.OA.06.2013.0059] [PMID: 25288982] ]. Thus, we hypothesized that fungal spread within the head after point inoculation, type II resistance, will be more appropriate to establish relationships with the three tested in vitro assays in one experimentation as noted for detached leaf [19Browne RA, Cooke BM. Development and evaluation of an in vitro detached leaf assay for pre-screening resistance to Fusarium head blight in wheat. Eur J Plant Pathol 2004; 110(1): 91-102. [http://dx.doi.org/10.1023/B:EJPP.0000010143.20226.21] , 21Browne RA, Murphy JP, Cooke BM, et al. Evaluation of components of Fusarium head blight resistance in soft red winter wheat germ plasm using a detached leaf assay. Plant Dis 2005; 89(4): 404-11. [http://dx.doi.org/10.1094/PD-89-0404] [PMID: 30795457] , 22Browne RA. Investigation into components of partial disease resistance, determined in vitro, and the concept of types of resistance to Fusarium head blight (FHB) in wheat. Eur J Plant Pathol 2009; 123(2): 229-34. [http://dx.doi.org/10.1007/s10658-008-9353-7] ], modified Petri-dish [26Purahong W, Alkadri D, Nipoti P, Pisi A, Lemmens M, Prodi A. Validation of a modified Petri-dish test to quantify aggressiveness of Fusarium graminearum in durum wheat. Eur J Plant Pathol 2012; 132(3): 381-91. [http://dx.doi.org/10.1007/s10658-011-9883-2] ] and seedling [23Shin S, Kim KH, Kang CS, et al. Simple method for the assessment of Fusarium head blight resistance in Korean wheat seedlings inoculated with Fusarium graminearum. Plant Pathol J 2014; 30(1): 25-32. [http://dx.doi.org/10.5423/PPJ.OA.06.2013.0059] [PMID: 25288982] ] assays. Effects of incubation period and lesion length did not appear to be important characteristics of quantitative resistance to FHB in Syrian wheat cultivars. Incubation period and lesion length did not distinguish between Cham1 and Cham6 showing different levels of type II quantitative resistance. Moreover, results from these two assays were poorly correlated with resistance in adult plants. Our results are in contradiction with those reported for commercially grown European wheat cultivars [19Browne RA, Cooke BM. Development and evaluation of an in vitro detached leaf assay for pre-screening resistance to Fusarium head blight in wheat. Eur J Plant Pathol 2004; 110(1): 91-102. [http://dx.doi.org/10.1023/B:EJPP.0000010143.20226.21] ] and U.S. soft red winter wheat entries [21Browne RA, Murphy JP, Cooke BM, et al. Evaluation of components of Fusarium head blight resistance in soft red winter wheat germ plasm using a detached leaf assay. Plant Dis 2005; 89(4): 404-11. [http://dx.doi.org/10.1094/PD-89-0404] [PMID: 30795457] ], in which shorter or longer incubation periods were correlated with higher levels of quantitative resistance according to origin of wheat cultivars. Furthermore, the results in the present research are not in accordance with those previously obtained for lesion length; moderately resistant European cultivars and four moderately resistant U.S. commercial cultivars had short lesion lengths in the detached leaf assay [19Browne RA, Cooke BM. Development and evaluation of an in vitro detached leaf assay for pre-screening resistance to Fusarium head blight in wheat. Eur J Plant Pathol 2004; 110(1): 91-102. [http://dx.doi.org/10.1023/B:EJPP.0000010143.20226.21] , 21Browne RA, Murphy JP, Cooke BM, et al. Evaluation of components of Fusarium head blight resistance in soft red winter wheat germ plasm using a detached leaf assay. Plant Dis 2005; 89(4): 404-11. [http://dx.doi.org/10.1094/PD-89-0404] [PMID: 30795457] ]. In contrast to our findings, Browne [22Browne RA. Investigation into components of partial disease resistance, determined in vitro, and the concept of types of resistance to Fusarium head blight (FHB) in wheat. Eur J Plant Pathol 2009; 123(2): 229-34. [http://dx.doi.org/10.1007/s10658-008-9353-7] ] found that shorter incubation periods and lesions have been related to an important component of whole-wheat FHB resistance measured by single point inoculation (type II). It could be that dichotomy among Syrian, European and U.S. wheat cultivars reflects the different genetic control of the highly effective FHB resistance as hypothesized by Browne and Cooke [19Browne RA, Cooke BM. Development and evaluation of an in vitro detached leaf assay for pre-screening resistance to Fusarium head blight in wheat. Eur J Plant Pathol 2004; 110(1): 91-102. [http://dx.doi.org/10.1023/B:EJPP.0000010143.20226.21] ]. However, there were significant differences in the resistance of two wheat cultivars as measured by Latent Period (LP). LP appears to be distinctive of the resistance or susceptibility levels in wheat to FHB infection at early stages, and longer latent periods has related to type II resistance on adult spikes. Similarly, longer latent periods have been related to FHB resistance (type II) under controlled conditions [22Browne RA. Investigation into components of partial disease resistance, determined in vitro, and the concept of types of resistance to Fusarium head blight (FHB) in wheat. Eur J Plant Pathol 2009; 123(2): 229-34. [http://dx.doi.org/10.1007/s10658-008-9353-7] ]. Also, our results agree with those reported for resistant European and U.S. wheat cultivars [19Browne RA, Cooke BM. Development and evaluation of an in vitro detached leaf assay for pre-screening resistance to Fusarium head blight in wheat. Eur J Plant Pathol 2004; 110(1): 91-102. [http://dx.doi.org/10.1023/B:EJPP.0000010143.20226.21] , 21Browne RA, Murphy JP, Cooke BM, et al. Evaluation of components of Fusarium head blight resistance in soft red winter wheat germ plasm using a detached leaf assay. Plant Dis 2005; 89(4): 404-11. [http://dx.doi.org/10.1094/PD-89-0404] [PMID: 30795457] ]. Also, the presence/absence of certain QTLs may explain these variations in the resistance responses of wheat cultivars following infection with FHB agents since some QTLs, i.e., Fhb1 and Qfhs.ifa-5A, has related to most effective wheat resistance to FHB [10Buerstmayr H, Ban T, Anderson JA. QTL mapping and marker-assisted selection for Fusarium head blight resistance in wheat: A review. Plant Breed 2009; 128(1): 1-26. [http://dx.doi.org/10.1111/j.1439-0523.2008.01550.x] ]. The pattern of chlorosis formation was similar to its observed pattern in the detached leaf assay described by Browne and Cooke [20Browne RA, Cooke BM. A comparative assessment of potential components of partial disease resistance to Fusarium head blight using a detached leaf assay of wheat, barley and oats. Eur J Plant Pathol 2005; 112(3): 247-58. [http://dx.doi.org/10.1007/s10658-005-2077-z] ]; chlorosis of the infected area occurred when lesions first developed. The reductions in germination rate and coleoptile length were not reliable methods to distinguish the two tested wheat cultivars. Our results are in accordance with those previously obtained in vitro [28Sakr N. In vitro assessment of Fusarium head blight spp. on wheat cultivars. Arch Phytopathol Pflanzenschutz 2017; 50(5-6): 254-61. [http://dx.doi.org/10.1080/03235408.2017.1297032] , 29Sakr N. Aggressiveness of Fusarium head blight species towards two modern Syrian wheat cultivars in an in vitro Petri-dish. Cereal Res Commun 2018; 46(3): 480-9. [http://dx.doi.org/10.1556/0806.46.2018.031] ]. Moreover, FHB resistance determined by reductions in germination rate and coleoptile length was also poorly correlated with resistance in adult plants. However, seed germination and coleoptile length methods are two assays routinely used to selection for FHB resistance. Higher germination rates were highly correlated with the degree of FHB type II resistance in adult plants [18Browne RA. Components of resistance to fusarium head blight (FHB) in wheat detected in a seed-germination assay with Microdochium majus and the relationship to FHB disease development and mycotoxin accumulation from Fusarium graminearum infection. Plant Pathol 2007; 56(1): 65-72. [http://dx.doi.org/10.1111/j.1365-3059.2006.01509.x] -22Browne RA. Investigation into components of partial disease resistance, determined in vitro, and the concept of types of resistance to Fusarium head blight (FHB) in wheat. Eur J Plant Pathol 2009; 123(2): 229-34. [http://dx.doi.org/10.1007/s10658-008-9353-7] ]. Soresi et al. [24Soresi D, Zappacosta D, Garayalde A, Miranda R, Carrera A. An in vitro assay for pre-screening resistance to Fusarium head blight in durum wheat. Phytopathol Mediterr 2015; 54(2): 253-64. [http://dx.doi.org/10.14601/Phytopathol_Mediterr-14986] ] found that coleoptile length was related with head blight resistance. Contrary, Shin et al. [23Shin S, Kim KH, Kang CS, et al. Simple method for the assessment of Fusarium head blight resistance in Korean wheat seedlings inoculated with Fusarium graminearum. Plant Pathol J 2014; 30(1): 25-32. [http://dx.doi.org/10.5423/PPJ.OA.06.2013.0059] [PMID: 25288982] ] noticed that reductions in germination rate were not correlated with FHB types I and II resistance. AUDPCstandard was of primary importance across all whole FHB disease components, accounting for the reduction of 17.78% between the two tested cultivars. AUDPCstandard was calculated from the decreasing number of healthy wheat seedlings after fungal inoculation of the seeds [26Purahong W, Alkadri D, Nipoti P, Pisi A, Lemmens M, Prodi A. Validation of a modified Petri-dish test to quantify aggressiveness of Fusarium graminearum in durum wheat. Eur J Plant Pathol 2012; 132(3): 381-91. [http://dx.doi.org/10.1007/s10658-011-9883-2] ]. The slower the reduction of the number of healthy seedlings, the more resistant is the cultivar [26Purahong W, Alkadri D, Nipoti P, Pisi A, Lemmens M, Prodi A. Validation of a modified Petri-dish test to quantify aggressiveness of Fusarium graminearum in durum wheat. Eur J Plant Pathol 2012; 132(3): 381-91. [http://dx.doi.org/10.1007/s10658-011-9883-2] ]. Our results are in accordance with previous in vitro analysis in which this criterion did distinguish between wheat cultivars [28Sakr N. In vitro assessment of Fusarium head blight spp. on wheat cultivars. Arch Phytopathol Pflanzenschutz 2017; 50(5-6): 254-61. [http://dx.doi.org/10.1080/03235408.2017.1297032] , 29Sakr N. Aggressiveness of Fusarium head blight species towards two modern Syrian wheat cultivars in an in vitro Petri-dish. Cereal Res Commun 2018; 46(3): 480-9. [http://dx.doi.org/10.1556/0806.46.2018.031] ]. Therefore, AUDPCstandard seems to be an efficient criterion for screening FHB resistance at early stages and has related to type II resistance on adult spikelets. In vitro AUDPCstandard data were highly significantly correlated with artificial inoculation data in the growth chamber on durum and bread wheat cultivars (Types I and II) [26Purahong W, Alkadri D, Nipoti P, Pisi A, Lemmens M, Prodi A. Validation of a modified Petri-dish test to quantify aggressiveness of Fusarium graminearum in durum wheat. Eur J Plant Pathol 2012; 132(3): 381-91. [http://dx.doi.org/10.1007/s10658-011-9883-2] , 27Sakr N. Aggressiveness of four Fusarium head blight species on wheat cultivars. Adv Hortic Sci 2017; 31(3): 199-203. [http://dx.doi.org/10.13128/ahs-20585] , 30Sakr N. Interaction between Triticum aestivum plants and four Fusarium head blight species on the level of pathogenicity: Detected in an in vitro Petri-dish assay. Acta Phytopathol Entomol Hung 2018; 53(2): 171-9. [http://dx.doi.org/10.1556/038.53.2018.010] , 31Sakr N. Intra- and inter-species variability of the aggressiveness in four Fusarium head blight species on durum wheat plants detected in an in vitro Petri-dish assay. Arch Phytopathol Pflanzenschutz 2019. [http://dx.doi.org/10.1080/03235408.2018.1495390] ]. The three quantitative components: percentage of infected seedlings of foliar-spraying, pin-point inoculations and lesion length of clip-dipping inoculation did not differentiate between the two tested Syrian wheat cultivars carrying different levels of quantitative resistance. Furthermore, results from these three in vitro components were not correlated with adult FHB resistance. However, lesion length was highly related with FHB head resistance [23Shin S, Kim KH, Kang CS, et al. Simple method for the assessment of Fusarium head blight resistance in Korean wheat seedlings inoculated with Fusarium graminearum. Plant Pathol J 2014; 30(1): 25-32. [http://dx.doi.org/10.5423/PPJ.OA.06.2013.0059] [PMID: 25288982] ]. Also, the percentage of infected seedlings (of foliar-spraying and pin-point inoculations) was poorly correlated with adult FHB resistance [23Shin S, Kim KH, Kang CS, et al. Simple method for the assessment of Fusarium head blight resistance in Korean wheat seedlings inoculated with Fusarium graminearum. Plant Pathol J 2014; 30(1): 25-32. [http://dx.doi.org/10.5423/PPJ.OA.06.2013.0059] [PMID: 25288982] ]. Thus, these three assays were not efficient methods to predict Type II resistance in adult plants. This is not surprising since the correlation between some in vitro assays and in planta indices for Type II was not stable and depended on resistance source origin; the exotic wheat germplasms which provide highly effective resistances to FHB resistance do not appear to be detected in the detached leaf [19Browne RA, Cooke BM. Development and evaluation of an in vitro detached leaf assay for pre-screening resistance to Fusarium head blight in wheat. Eur J Plant Pathol 2004; 110(1): 91-102. [http://dx.doi.org/10.1023/B:EJPP.0000010143.20226.21] , 20Browne RA, Cooke BM. A comparative assessment of potential components of partial disease resistance to Fusarium head blight using a detached leaf assay of wheat, barley and oats. Eur J Plant Pathol 2005; 112(3): 247-58. [http://dx.doi.org/10.1007/s10658-005-2077-z] ] or seed germination [18Browne RA. Components of resistance to fusarium head blight (FHB) in wheat detected in a seed-germination assay with Microdochium majus and the relationship to FHB disease development and mycotoxin accumulation from Fusarium graminearum infection. Plant Pathol 2007; 56(1): 65-72. [http://dx.doi.org/10.1111/j.1365-3059.2006.01509.x] ] assays. Quantitative resistant wheat cultivars are identified by low in planta disease spikelet values of the fungus compared with the susceptible one [7Steiner B, Buerstmayr M, Michel S, Schweiger W, Lemmens M, Buerstmayr H. Breeding strategies and advances in line selection for Fusarium head blight resistance in wheat. Trop Plant Pathol 2017; 42(3): 165-74. [http://dx.doi.org/10.1007/s40858-017-0127-7] -9Mesterhazy A. Types and components of resistance to Fusarium head blight of wheat. Plant Breed 1995; 114(5): 377-86. [http://dx.doi.org/10.1111/j.1439-0523.1995.tb00816.x] ], and long Latent Period and less AUDPCstandard determined in vitro [19Browne RA, Cooke BM. Development and evaluation of an in vitro detached leaf assay for pre-screening resistance to Fusarium head blight in wheat. Eur J Plant Pathol 2004; 110(1): 91-102. [http://dx.doi.org/10.1023/B:EJPP.0000010143.20226.21] -22Browne RA. Investigation into components of partial disease resistance, determined in vitro, and the concept of types of resistance to Fusarium head blight (FHB) in wheat. Eur J Plant Pathol 2009; 123(2): 229-34. [http://dx.doi.org/10.1007/s10658-008-9353-7] , 26Purahong W, Alkadri D, Nipoti P, Pisi A, Lemmens M, Prodi A. Validation of a modified Petri-dish test to quantify aggressiveness of Fusarium graminearum in durum wheat. Eur J Plant Pathol 2012; 132(3): 381-91. [http://dx.doi.org/10.1007/s10658-011-9883-2] ]. Cham1 seems to exhibit more FHB disease severity and less latent period than Cham6. AUDPCstandard of Cham6 was 17.78% less that that of Cham1. Thus, Cham6 appears to be more resistant than Cham1 detected using in vitro and floret inoculation assays. This observation suggests that in Cham6, the development of the FHB pathogens was slowed down, and might be due to resistance mechanisms expressed by differential responses conferred by QTL during FHB infection in wheat plants [10Buerstmayr H, Ban T, Anderson JA. QTL mapping and marker-assisted selection for Fusarium head blight resistance in wheat: A review. Plant Breed 2009; 128(1): 1-26. [http://dx.doi.org/10.1111/j.1439-0523.2008.01550.x] ]. In this research, the two in vitro components, latent period (LP) and AUDPCstandard, partially reproduced in planta testing may provide a better understanding to describe the level of wheat resistance to FHB infection. Since greater FHB disease-type II resistance were related to longer latent period and less AUDPCstandard, these two in vitro components could reflect aspects of a resistance reaction by the plant rather than simply susceptibility and pathogen development. For example, LP and AUDPCstandard may indicate tolerance of infection by the host, and asymptomatic colonization, rather than inhibition of pathogen development [18Browne RA. Components of resistance to fusarium head blight (FHB) in wheat detected in a seed-germination assay with Microdochium majus and the relationship to FHB disease development and mycotoxin accumulation from Fusarium graminearum infection. Plant Pathol 2007; 56(1): 65-72. [http://dx.doi.org/10.1111/j.1365-3059.2006.01509.x] ]. Also, the measured differences in LP and AUDPCstandard appear to be different aspects of similar response mechanisms against FHB in the whole plant at the cellular level [18Browne RA. Components of resistance to fusarium head blight (FHB) in wheat detected in a seed-germination assay with Microdochium majus and the relationship to FHB disease development and mycotoxin accumulation from Fusarium graminearum infection. Plant Pathol 2007; 56(1): 65-72. [http://dx.doi.org/10.1111/j.1365-3059.2006.01509.x] ]. Thus, this work supports the view that the current model of types of resistance is an oversimplification of the interacting mechanisms underlying expression of FHB resistance [22Browne RA. Investigation into components of partial disease resistance, determined in vitro, and the concept of types of resistance to Fusarium head blight (FHB) in wheat. Eur J Plant Pathol 2009; 123(2): 229-34. [http://dx.doi.org/10.1007/s10658-008-9353-7] , 25Sakr N. Components of quantitative resistance in barley plants to Fusarium head blight infection determined using three in vitro assays. J Plant Prot Res 2018; 58(2): 176-83. [http://dx.doi.org/10.24425/122933] ]. The two in vitro components, LP and AUDPCstandard, as indicators of mechanisms of resistance occurring in the whole plant during FHB infection, did predict in planta Type II resistance in adult plants, and the other seven tested components did not. It appears that the criteria such as latent period and AUDPCstandard may be useful to measure quantitative resistance in wheat to FHB at early stages as reported for in vitro barley resistance [25Sakr N. Components of quantitative resistance in barley plants to Fusarium head blight infection determined using three in vitro assays. J Plant Prot Res 2018; 58(2): 176-83. [http://dx.doi.org/10.24425/122933] ]. However, the other measured seven in vitro components seem to be not distinctive of the resistance or susceptibility levels in wheat to FHB infection at subsequent stages of disease development as noted for in vitro FHB-barely association [25Sakr N. Components of quantitative resistance in barley plants to Fusarium head blight infection determined using three in vitro assays. J Plant Prot Res 2018; 58(2): 176-83. [http://dx.doi.org/10.24425/122933] ]. In wheat- and barley-FHB researches, it has been proposed that the individual in vitro and in planta components not only influence the total level of resistance but also have a variable individual influence on the disease development [23Shin S, Kim KH, Kang CS, et al. Simple method for the assessment of Fusarium head blight resistance in Korean wheat seedlings inoculated with Fusarium graminearum. Plant Pathol J 2014; 30(1): 25-32. [http://dx.doi.org/10.5423/PPJ.OA.06.2013.0059] [PMID: 25288982] , 25Sakr N. Components of quantitative resistance in barley plants to Fusarium head blight infection determined using three in vitro assays. J Plant Prot Res 2018; 58(2): 176-83. [http://dx.doi.org/10.24425/122933] ]. Furthermore, this work reflects the polygenic nature of head blight resistance and the importance of in vitro methods to determine specific sources/mechanisms of FHB resistance, which cannot be distinguished on the basis of in planta whole-plant resistance alone as proposed by Browne and Cooke [19Browne RA, Cooke BM. Development and evaluation of an in vitro detached leaf assay for pre-screening resistance to Fusarium head blight in wheat. Eur J Plant Pathol 2004; 110(1): 91-102. [http://dx.doi.org/10.1023/B:EJPP.0000010143.20226.21] ]. The biological explanation for an association between in vitro and in planta responses to FHB infection remains unknown, but it can be hypothesized that similar genetic pathways become activated at both developmental stages [24Soresi D, Zappacosta D, Garayalde A, Miranda R, Carrera A. An in vitro assay for pre-screening resistance to Fusarium head blight in durum wheat. Phytopathol Mediterr 2015; 54(2): 253-64. [http://dx.doi.org/10.14601/Phytopathol_Mediterr-14986] ]. Since only two wheat cultivars were tested here, further research using a large sample of available Syrian wheat cultivars is needed to validate our results in vitro, under controlled and field conditions. Gomez KA, Gomez AA. Statistical Procedures for Agricultural Research 2nd ed. 2nd ed.1984; 680.